A Heat Diffuser allows you to cook in many of the clay cookware that we carry, and allows you to slow simmer for a long time and avoid scorching or burning. It is also useful in any pot where you want to control the heat and eliminate hot spots. Great for preparing slow cooking casseroles, custards, deserts, and melting chocolate. The SimmerMat™ Heat Diffuser is made from high-quality zero-carbon, enameled steel. Its octagon shape has 12 strategically-placed cones which transmit heat evenly to the base of the pot. The Heat Diffuser can be used on a gas or electric stovetop, including glass and ceramic top. To the Heat diffuser, simply place the Diffuser between the heat source and the pot. For glass, ceramic or induction cook tops, place the Heat Diffuser on the cooking surface with the POINTS DOWN. 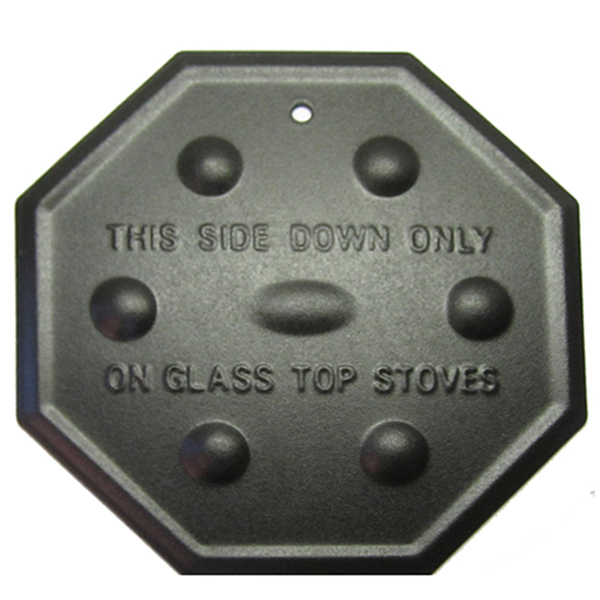 For gas, electric or solid fuel cookers, place the Heat Diffuser on the cooking surface POINTS UP. The heat diffuser is designed to work on low heat setting. If your recipe requires bringing the contents to a boil, slowly heat the contents in the pot without the Heat Diffuser until it boils according to your cookware’s instructions. Once it boils, remove the pot from the heat, reduce the heat and then place the Diffuser on the heat source and return the pot to the heat source. • Never leave the Heat Diffuser unattended on a heat source without a pot on top. • Never preheat the Heat Diffuser before use. • Always use tongs when handling a hot Heat Diffuser to avoid injury. • Use the Heat Diffuser only on low heat settings. The Heat Diffuser is dishwasher safe and can be placed in the dishwasher for cleaning. For hand washing, use a soft cloth and do not use harsh brushes or scouring pads as they can damage the surface.